I think chicken thighs have so much more flavor than your standard boneless chicken breast. Of course there is more fat in the thigh, but that does help to get some flavor and you can always take the skin off or buy skinless. Chicken thighs are generally a lot cheaper to buy also and I very often buy a large pack of bone-in chicken thighs so we always have some in the freezer to use for a quick meal. Such was the case last night when I wanted something simple to make for dinner and had taken some thighs out the day before. I decided I wanted to try this simple recipe from Bon Appetit for a citrus marinated chicken thighs. it has just a few ingredients and the prep work and cooking can all be done in under and hour so you can have dinner on the table quickly. Set aside 1/4 cup of the sliced scallions for later in the recipe. Pulse the cilantro, garlic, lime zest, orange zest, lime juice, orange juice, soy sauce, vegetable oil, kosher salt and the remaining sliced scallions in a food processor or blender until a coarse puree has formed. Set aside 1/4 cup of the marinade for later use. Place the remaining marinade in a large resealable plastic bag. Add the chicken thighs, seal the bag, and turn the bag to coat the chicken well. Chill the chicken in the refrigerator for at least 20 minutes. Preheat the broiler. Remove the chicken from the marinade and place the chicken, skin side down, on a foil lined broiler-safe baking sheet. Discard the marinade. Broil the chicken pieces until they are lightly browned, about 5 minutes. Turn the chicken over and continue to broil it skin side up until it is cooked completely through and an instant-read thermometer inserted into the thickest part of a thigh registers 165 degrees, about 12 to 15 minutes longer. Serve the chicken with the reserved marinade and the reserved sliced scallions. You can start to marinade the chicken about 2 hours before if you want to get a bigger head start, but try not to marinade it any longer than that or the chicken will start to break down from the acids. With this recipe you get the really nice crispy skin that is perfect on a piece of chicken. 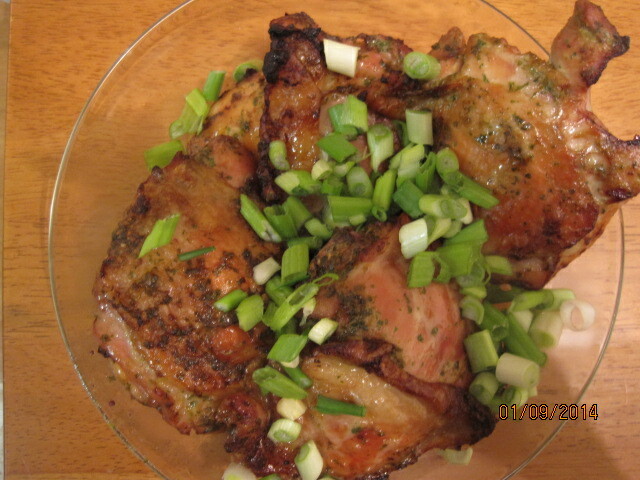 You also get great flavor from the marinade with the scallions, citrus zest, citrus juices and cilantro. The marinade has a pesto look to it and has great flavor. 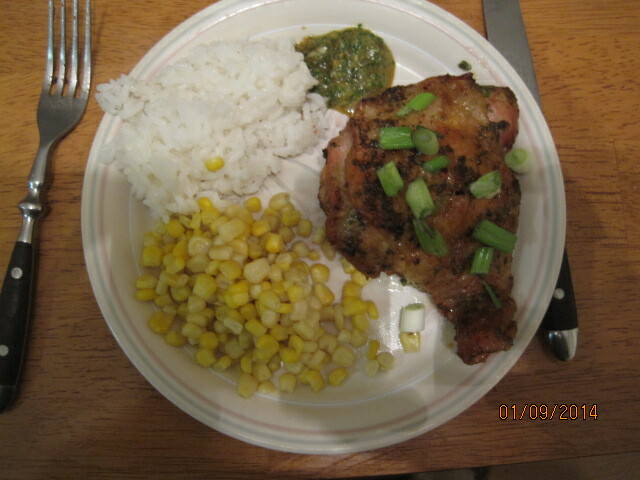 I used some the leftover marinade on my plate to mix with the white rice I had also made to go along with the meal. I also made some corn to round out the meal. I think you could easily use this marinade on other chicken pieces if you preferred drumsticks, wings or even breasts instead of the thighs. You may have to adjust your cooking time accordingly if you use a different piece of chicken, but I think you get great flavor no matter what.